Books, Bargains, Blessings: Christmas Without Debt June Edition: Win Your Christmas! 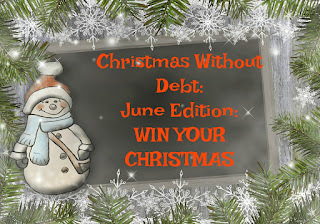 Christmas Without Debt June Edition: Win Your Christmas! Can you believe we're almost seven months until Christmas? I keep a countdown in my planner so it doesn't catch me off guard and I will be prepared for when Christmas rolls around, both with online selling, and just plain out preparing for Christmas with gifts, goodies, and decorations. This month I want to talk a bit about entering to win your Christmas. There are no guarantees that you will win, but it's something fun to do, and normally every year for the past twenty I have won a few items I was able to use as gifts. Last year I won a nice set of watercolor pencils I was able to give my husband who likes to do art. I also won him a wood chisel set which he thought was really cool. His grandfather was into woodworking, and while he hadn't done any before Christmas, he was excited to try his hand at it. Prizes can range from a small stocking stuffer to something worth hundreds of dollars. It's not uncommon for twitter parties to have prizes of Amazon Gift Cards, so if you would win one of those you could use it towards Christmas shopping. Many people who enter contests and sweepstakes even occasionally have what they call a prize closet. If you win something you don't immediately have a need for, put it in the prize closet (or a storage tote.) It might make a perfect gift a year or two down the road for someone. I call my tote a prize closet, but truth is, anything I get free will be put in there. If I get something that would work as a stocking stuffer from a shopping card such as Kroger, it will go in my prize closet if it something that won't expire before Christmas. A prize closet won't solve all your Christmas shopping, but it certainly can stretch your gift budget. I have won some interesting and amazing things I would not have been able to buy. My son enjoyed the motorcycle gift certificate. I can no longer spend lots of money on his seasonal presents, so it is good when I can give him something nice. I just won a certificate for a golf trip. Will be interesting to figure out who in the family will want this one!